On Friday, West Virginia Judge Irene C. Berger denied every point of the Grand Lodge of West Virginia's motion to dismiss the lawsuit brought by Past Grand Master Frank Haas. Since the GL's annual communication is at the end of October, it will be curious to see which comes first. Not long ago, I posted an announcement of Union Lodge No. 38's annual Eblen's Cave Degree. I have never attended this event myself, but at face value, I believed the concept was an interesting one—presentation of a different state's Master Mason ritual each year by degree teams that traveled from around the country. On Friday night August 15, a North Carolina EA Degree was exemplified by Creasy Proctor Lodge #679 on Steven Matthews. According to the Cave degree website, 166 Masons, representing 77 Lodges, 15 States, Ontario Canada and England attended. On Saturday, a Georgia Master Mason Degree was conferred by Pickens Star Lodge #220, of Jasper GA on William Gary Boyes. I received the following note from an Indiana brother this evening who attended Georgia's presentation. Some 250 Masons, representing 96 Lodges, 14 States, Ontario Canada and England were present to witness their "performance." Back from the Cave Degree in TN... this was my third year, and it's generally been a wonderful time. This year left me with a _really_ bad taste in my mouth. In short, the Degree Team from Georgia put on the most banal, disgusting Parody of the MM that I've seen in all my 26 years as a Mason. If I had been Raised with such Tomfoolery, I'd never have set foot in a Lodge again. Period. If that wasn't bad enough, the Graveside Prayer turned into a 25-minute Sermon, calling Jesus down to Bless us, our Children, our Grandchildren... and damn the Unbelievers into the Firey Pit for Eternity if they don't see Jesus (mentioned at least 25 times) as Lord and Master of all. I was half-expecting the guy to pull out a basket of snakes from under his Apron, and start handing them around. It was so bad, that most of us who hadn't escaped beforehand were in slack-jawed Shock by the end, and the Cave emptied in record time. . . I haven't begun to chip at the Iceberg. IN and TN are fairly distinct in our Working... yet our Bro. down there was just as apalled as I was. Rewording the Obligation (to explain that "Clandestine" means "Prince Hall" in modern English) really riled me. I'm sorry to have bothered you with this... but I don't know anyone who's Travelled as you have. Their disgusting, juvenile performance has left me a little wounded . . . I've never seen anything so utterly Unmasonic as what was pulled on us last Saturday . I know it's not the Norm... but have you ever seen anything similar ? No, I haven't. And I hope I don't. At approximately 4:00PM today, Brother Robert Emerson Hancock Jr., PGM, passed to the Celestial Lodge. Bob was indeed one of a kind, and his shoes will be very difficult to fill in Indiana Freemasonry. He once remarked during a meeting I attended that there was no reason to be a Freemason if it wasn't fun, and Bob made sure his Masonry was fun every single day. Funeral services are being planned and information will be forthcoming. Please keep his wife Suzy, his son Rob and their family in your thoughts and prayers. Here are the arrangements for the calling and services for Most Worshipful Brother Robert Emerson Hancock, Jr., Past Grand Master of Indiana and Past Potentate of Murat Shriners. MWBro. Robert E. Hancock, Past Grand Master of Indiana, suffered an aneurism last Tuesday, after a hospital procedure that was intended to clear his arteries of blockages. As of this weekend, he remains in St. Vincent Hospital in Indianapolis, paralyzed on one side, and unable to speak. He is able to breathe on his own, but is on a ventilator to make breathing easier. Anyone who knows Bob is aware of his larger than life persona. 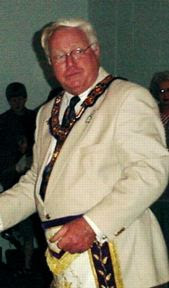 He was a controversial Grand Master back in 1998-99, making such *shocking* changes in Indiana Masonry such as requiring all lodge business meetings to open on the EA degree (like the rest of the Masonic world does outside of the US), and cementing ties between the Grand Lodge of Indiana and the newly recognized Most Worshipful Prince Hall Grand Lodge of Indiana. Because of his actions, the Grand Lodge voted the following year to rescind several of his recommendations, and to prevent future grand masters from breaking existing GL law by edict. In the last year, Bob has been traveling the state speaking on behalf of the Scottish Rite Valley of Indianapolis, and the idea that he is unable to speak is almost unthinkable. Bob's family has asked for the prayers of all who know him, but request that friends not call at this time. I had the honor yesterday of joining 70 brethren from Indiana, Kentucky, Michigan, Illinois and Ohio in being admitted into the Royal Order of Scotland. Many thanks to the grand officers who presented the beautiful degree work. Check out Brother John Karnes' article about the Royal Order of Scotland from the July/August 2005 Scottish Rite Journal. Modern Freemasonry began in the pubs and taverns of London. So it with great sadness that I read over the weekend that more than 1,400 pubs in Britain closed last year, and more than 6,000 are expected to be shuttered within the next five years. Nationally, an average of 4 pubs shut down every day. Once source claims that more than half of British villages are dry for the first time since the Norman Conquest in 1066. The culprit? Some are trying to blame cheap supermarkets selling beer and a frankly small increase in the beer tax. But the real reason is the recently enacted smoking ban. Smokers have been hounded out of their favorite haunts, and their friends have gone with them. Instead of socializing at the bar, they pick up a cheap 6-pack and stay home, away from the clucking of the anti-smoking crowd—who have NOT flocked to support the now smoke-free pubs. They have killed off businesses they never intended to set foot into in the first place. And a social activity that has been the backbone of English working class society for literally centuries has been destroyed. The European Union has enforced the smoking ban all across Europe, removing the decision from local lawmakers, citizens and business owners. 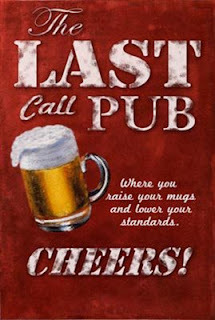 And the trend of pub closures all across Europe is increasing at an alarming rate. Brother and friend Stephen Dafoe has been a busy lad lately. His new book, The Compasses and the Cross, is due out in September. It comes on the heels of last year's Nobly Born. Coming soon is his four-part Templar comic, Outremer. This week he took up the project of overhauling his ambitious and endlessly informative online Masonic Dictionary. The project really is what it is billed as: a daily advancement in Masonic education. 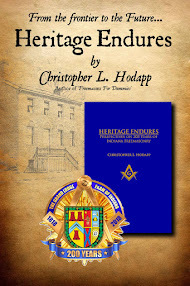 Stephen is refurbishing close to 700 pages of content, divided into several categories: History, Symbolism, Philosophy, Biographies, Papers and Masonic Book Reviews. An improved search engine has also been installed. The Papers section contains a Knights of the North project from 2006 that addressed the challenges confronting Freemasonry from A to Z. It is a collaborative sequel to Laudable Pursuit. The Masonic Home of New Jersey, a retirement community on Jacksonville Road, is one of the latest to embrace this technology. The plan is to erect more than 5,000 solar panels on a 3-acre farm it owns off Oxmead Road. Heflich said the Masonic Home pays an electric bill of $1.5 million every year. The solar panels should supply 11 percent of the home's electricity needs. If it is successful, Heflich said the home would consider adding even more panels in the future. “Ideally, if this works, in 10 to 15 years, we'd like to produce all our own energy,” he said. Heflich said the project, if it moves forward, would be one of the largest in the state. “For a nonprofit, I know we are cutting-edge,” he said. The Hermetic Order of Martinists (HOM) has a new website this summer. HOM is a Martinist Order that is only open to Master Masons of a Lodge under the authority of the United Grand Lodge of England, or of a Grand Lodge recognised by them, who are trinitarian Christians and are members of the Societas Rosicruciana In Anglia (SRIA). The Hermetic Order of Martinists (HOM) was developed from the French Ordre Martiniste et Synarchique (OMS) in 1984 by Louis Bentin, Grand Master of the Britannic Grand Lodge of the OMS. Most American Masons (and non-Masons alike) have rarely, if ever, heard of the Martinists. Louis-Claude de Saint-Martin was a poor French nobleman who was born in 1843. As a young believer in mysticism, he traveled throughout Europe, making many converts. He was briefly imprisoned during the French Revolution, but survived because local authorities were in desperate need of schoolteachers. Louis-Claude was only too happy to oblige and become one. Over the years, he became a student of an 18th century Kabbalist named Joachim Martinez Pasquales, and later translated several obscure 17th century works by a German mystic, Jacob Böhme, into French. Böhme, known as “The Teutonic Philospher,” had theorized that in order to achieve a state of grace, Man had to fall away from God and do battle with the demons and evil angels who caused the sins of the world. Only after spiritual victory over these evils could Man again return to God’s good graces. Using both authors as his inspiration, Saint-Martin developed his own philosophy about Life, the Universe and Everything, called the “Way of the Heart.” Saint-Martin’s writings were signed by the enigmatic name of the Unknown Philosopher, and they quickly became popular. Study groups began to pop up, called the Society of the Unknown Philosopher. One of Saint-Martin’s biggest objections to the occult, esoteric and fraternal societies of Europe at the time was their refusal to allow women as members, and his was one of the first to grant women equal membership status. Saint-Martin ‘s writings slipped into obscurity after his death in 1803, but an enthusiastic student would rediscover them and change all that. Gerard Encausse (who went by the name of Papus) resurrected . Because of Saint-Martin, they came to call themselves Martinists. Not surprisingly, there was much crossover between the usual suspects involved in 19th century esotericism: Rosicrucians, Freemasons, Gnostics, and these new Martinists. In 1888, Encausse formed a mystery school called the Ordere Martinist, and by 1900, there were chapters in a dozen countries, with hundreds of members. World War I killed off the principal leaders of the Order, and the central organization dissolved. But a small sect of Martinists became enamored with a movement called Synarchy, an attempt to influence European countries by means of secretive, philosophical societies. Synarchie had been promoted in the 1890’s by an occult mystic named Alexandre Saint-Yves d’Alveydre, who claimed he was receiving telepathic messages from Shangri-La, directing his actions for world takeover. A small clot of enthusiastic Martinists got excited at the prospect of infiltrating the governments of Europe, most especially the notion of restoring the monarchy in France, and formed the Ordre Martiniste Synarchie. World War II all but destroyed Martinist societies (and hundreds of others) in Europe as the Nazis outlawed them, and imprisoned or executed most members of so-called “secret societies” that the regime hadn’t created themselves. There are several groups of Martinist-derived orders around the world today. The Traditional Martinist Order had made its way to the U.S. through Rosicrucian groups in the 1930s, and it survives today. The Internet has done much to spread Saint-Martin’s philosophies, and new groups have appeared recently along with the traditional ones. They cover a broad range of philosophies and disciplines, with some incorporating Rosicrucian influences, some borrowing from the Memphis-Mizraim branch of Freemasonry. And some simply adhere strictly to Saint-Martin’s philosophies. The Charleston Gazette is reporting new developments in the case of Frank Haas vs. the Grand Lodge of West Virginia. There must have been no shortage of heartburn in the Grand Lodge office when it was discovered the case was being heard by an African American woman, which, considering some of the issues in the case, pegs the irony meter. The Grand Lodge's counsel John Tinney has has asked Judge Irene C. Berger to throw out the case, saying Haas has not exhausted the appeals process within the Grand Lodge yet. The edict expelling Haas would be part of a report presented by the grand master at the end of his term, Tinney said. Members of the Grand Lodge then have the opportunity to vote to accept or reject each part of that report. Following that, Haas could appeal to the Grievance and Appeal Committee, who would also present their findings for the approval of Grand Lodge members, he said. Haas could finally appeal to the Jurisprudence Committee, whose report would again be subject to approval of the Grand Lodge members, he said. Tinney asked Berger to adopt a "hands-off" policy toward the Masons, saying that courts in West Virginia generally do not interject into an organization's processes until they have run their course. Haas' attorney, Bob Allen, maintained that any effort by Haas to seek reinstatement in a Masonic setting would be a sham. "If this court dismisses this complaint, he's a goner," he said. Members of the committees that hear appeals serve at the will and pleasure of the grand master, and their findings could be easily influenced, he said. Haas tried to appeal his expulsion within the organization, but received no formal acknowledgement of his grievance until he filed the lawsuit, Allen said. In another development, on Monday, the Grand Master of the Most Worshipful Prince Hall Grand Lodge of West Virginia, WWBro, Robin Griffith, filed an amicus brief in support of Haas. The brief points out that West Virginia is one of only 10 states where the Grand Lodge does not recognize their Prince Hall counterparts, which were established because black Masons are traditionally not welcome in mainstream lodges. If nothing else comes out of this from a legal standpoint, this is a bold philosophical and symbolic move on the part of the MWPHGLofWV in support of Haas. In their court filings, the defendants have asked Haas to identify the names, e-mail addresses, aliases and/or pen names of all individuals who contribute or comment on the Masonic Crusade site. The interrogatories specifically ask for information on individuals who post under the names "I.M. Hiram" and "A Mason," and ask Haas to describe his involvement in "the mass e-mailing campaign of the individual or individuals" writing as I.M. Hiram. BTW, on a side note, I do wish someone in the Grand Lodge office would let their web administrator know the GL of WV's home page title reads "Grang Lodge." They don't seem to accept my emails. And since I'm looking at websites, somebody needs to tell the MW Prince Hall GL of West Virginia they could probably stand a more uplifting piece of music on their website besides "The Thrill Is Gone." Judge Berger has indicated she will rule on the motion to dismiss within two weeks. The Association of the Sovereign Order of the Temple of Christ, whose members claim to be descended from the legendary crusaders, have filed a lawsuit against Benedict XVI calling for him to recognise the seizure of assets worth €100 billion (US$150 billion). And I am the real Anastasia. Freemasons and friends in and around central Indiana next weekend - stop in and enjoy the day at the Indiana Masonic Home Festival in Franklin on Sunday, August 3rd. It's earlier in the month this year than in the past. I'll be there with books, or bring your copy from home - I'll be happy to sign it. Alice will be there too, serving up popcorn for the Social Order of the Beauceant. Gates open at 10:00 AM. There will be music, food, games, plus Civil War and World War II reenactors. Come out and have a great day! Saturday, August 23rd, 2008 from 8am-early afternoon. Light breakfast & lunch will be served. 9AM-10AM: WBro. Marvin L. Ford, PM, "The Anti-Masonic Presidential Candidates"
10AM-11AM:WBro. Lawrence V. Kaminsky, PM, Past Grand Commander of Indiana Knights Templar: "The Holy Saints John"
11AM-12PM: WBro. John Bridegroom, PM: "The Enochian Ties To Freemasonry"
1PM-2PM: WBro. James Dillman, PM: "Indiana Freemasons' Hall"
A $10 Donation is requested to help pay for food/drink and travel expenses. 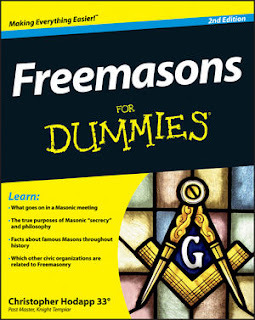 Open to Master Masons only. If you are interested in attending, please contact brother Colin Peterson.